The road to graphene’s commercialization starts here. Grafoid has entered into a number of high-profile joint venture application development relationships with leading industrial and academic partners around the world. The founding of joint venture relationships to develop next-generation MesoGraf™-based products drive Grafoid’s business model. Royalties will primarily drive revenue. Grafoid, under special terms and circumstances, will sell MesoGraf™ on a limited basis to companies and academic institutions. Grafoid’s extensive joint venture relationships — 17 currently — demonstrate the Company’s global market penetration and acceptance attained over a 24-month period. 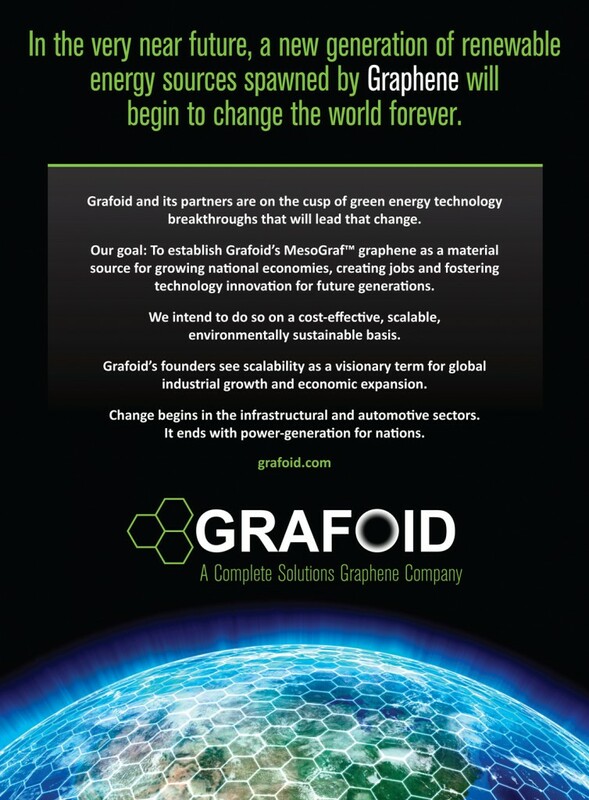 Grafoid’s process, intended to lead the global commercialization of graphene, is unique. No other known graphene produced can match the characteristics of MesoGraf™ — low cost, mass produced, with minimal defects. In the process of establishing joint venture relationships, Grafoid aims to significantly increase its global projections for marketplace penetration. Grafoid believes that, for the first time, industry will have access to high quality graphene in bulk at affordable prices. Mitsui is one of the most diversified comprehensive trading, investment and service companies in the world, developing a wide range of businesses in six core areas: Metals, Machinery and Infrastructure, Chemicals, Energy, Lifestyle, and Innovation and Corporate Development. Headquartered in Tokyo, Mitsui maintains a global network of 146 offices in 66 countries, as well as 320 subsidiaries and associated companies worldwide. Grafoid has been engaged with Mitsui for nearly two years. Grafoid has been functionalizing MesoGraf™ for specific Japanese market applications and, with Mitsui’s participation, is in the process of completing a countrywide market study to determine the size potential of MesoGraf™ sales in Japan. Consistently ranked Canada’s most innovative university, the University of Waterloo is home to advanced research and teaching in science and engineering, health, environment, arts and social sciences. From quantum computing and nanotechnology to clinical psychology and health sciences research, Waterloo brings ideas and brilliant minds together, inspiring innovations with real impact today and in the future. Grafoid’s joint venture with the University of Waterloo is investigating graphene substitutions for graphite in fuel cells, supercapacitors and ultracapacitors; high-performance graphene electrochemical energy storage systems for the automotive and portable electronics sectors; as well as MesoGraf’s functionalization for use in wet or dry oil-spill recovery and water treatment, filtration and desalination projects. Patents have been filed. Phos Solar Systems is a Greek-based company that designs full-spectrum solar energy systems. Phos’ Full Spectrum Energy Systems Technology is the only technology currently able to utilize nearly 100% of the sun’s radiation, thereby avoiding the significant losses of existing solar technologies. Grafoid’s joint venture with Phos develops thermal management solutions for standalone solar systems, integrating MesoGraf™ in solar panels; prototypes imminent. Other unannounced joint development projects are underway with a number of major multi-national corporations and formal announcements will be made in due course. For reasons of commercial confidentiality, Grafoid is prevented from disclosing many of its ongoing joint venture projects. Copyright © 2010-2015 Grafoid Inc. All Rights Reserved.